However, whereas planning for offshore wind is advanced, research on various forms of mariculture is lagging behind and even more so on combinations of those. With the exception of the Danish Rødsand II wind park, no practical pilot has ever been carried out throughout the Baltic Sea. As a result knowledge and real data are extremely limited even on world-wide scale. 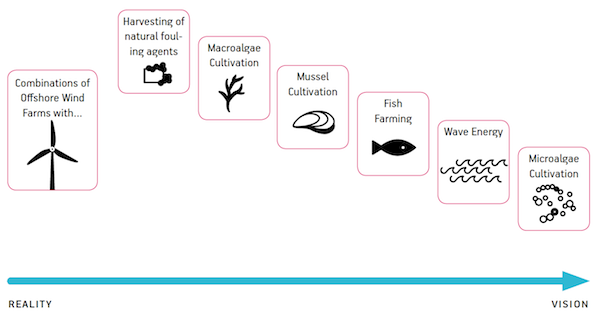 The development is also hampered by the lack of tradition and economic incentives (with the exception of possible image gains) for wind power companies to cooperate with the aquaculture sector. Even less is known about wind-wave combinations. Using the same infrastructure for installation and energy transmission should be investigatedvery carefully as it seems to be an efficient way of increasing the utilization factor of sea space. Whereas the concept of “spatial efficiency” promoting as much multi-uses as possible in order to leave as much space as possible free of use is very attractive at a theoretical level, practical evidence is missing. Thus political support is necessary to promote the set up of demonstration plants and pilot tests, which may hopefully provide convincing data with respect to positive environmental results, suitable technical solutions and economies of cooperation and scale. There is already a good level of communication between the various bodies dealing with maritime spatial planning within the Baltic Sea Region, providing a good basis for creating such cross-sectoral win-win situations.